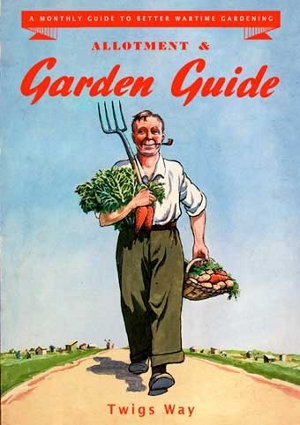 Produced by the Ministry of Agriculture, the Allotment and Garden Guides were issued monthly throughout 1945. Aimed at the amateur gardener they were to be the final rallying call in the wartime campaign to Dig for Victory. Concentrating on the productive garden, the guides were designed to take the amateur gardener through the basic tasks of each month. Many of the subjects tackled are as relevant now as they were then. How to make a compost heap, when to sow marrow seed, which seeds are they easiest to save, are still popular topics in the modern gardening media. However, other subjects convey the war-time difficulties: seed shortages due to enemy occupation in Europe, regulations on flower growing, and the very real prospect of running out of food next winter. Packed with additional photographs and illustrations, Twigs Way gives an historical overview to gardening during the Second world war and comments on each month of the guide. Many people still work allotment or vegetable plots that were first established during the war years, ‘inheriting’ them from a generation that used these guides as their gardening bibles. To read the Guides now is to experience a sense of both the urgency of the war-time garden, and the timelessness of the processes of gardening.